By February of 2005, she had published a book bearing the same name, in which she recounts her journey iinterpspersed with a series of interviews with some of the most prominent filmmakers in the region, including Sobhi Al-Zobaidi, Simone Bitton, Tawfiq Abut Wael, Mai Masri, Ram Loevy, Avi Mograbi, Georges Khleifi…The second edition of the biennale festival took place from 1 to 7 June 2005. In the continuity of this strong beginning, we proudly presented to you the third edition from 21 to 27 November 2007. We recognised the need to widen our approach, for the whole area is implicated in this tragic and endless conflict and that is why the name of the event is now Middle East: What Can Cinema Do?. This film week is held at the cinema Les 3 Luxembourg. Art house cinema owners Gérard and Anne Vaugeois have played an essential role in hosting Middle East: What Can Cinema Do?. Their dedication to bringing thought-provoking films and filmmakers to meet movie audiences on a regular basis has guaranteed that the event and the venue have been in perfect symbiosis. Le 29 novembre 1947, l'assemblée générale des Nations Unies votait le plan de partage de la Palestine qui proposait aux Palestiniens 47% du territoire de la Palestine du mandat britannique. Aujourd'hui, toutes les initiatives de paix sont bien en dessous et depuis les accords d'Oslo de 1993 qui prévoyaient la constitution d'un Etat palestinien dans un délai de cinq ans, le mieux que puissent espérer les Palestiniens est de récupérer 22% de leur territoire d'origine. Press clippings presenting the third edition of Middle East, What Can Cinema Do? were seen on many Internet sites, in the print press, heard on the radio as well as several special mentions in notable blogs (René Naba – AFP; Charles Enderlin – France 2; Alain Gresh – Le Monde Diplomatique). The Iron Wall opened Middle East: What Can Cinema Do? Screened in tandem with our opening debate - the Israeli settlement of Palestinian land, we were honoured to receive Leila Shahid (EU Palestinian Delgate), Michel Warschawski (Israeli peace activist, journalist and director of the AIC) and Dominique Vidal (Le Monde Diplomatique) for this kick-off, along with director Mohammed Alatar. We have thus reached the third edition of what has become an anticipated biennale meeting and we would so much like to boast a real change towards peace in the Israel-Palestine situation. Alas, it seems we are further away than ever from it and the abscess that poisons all civilian and political life in the Middle East has only spread, igniting new centres of death and destruction. Paris, a city of peace and freedom, knows how much cinema, a universal art rich in diversity, is a powerful vector of dialogue and mutual knowledge. Exactly 60 years ago on November 29, 1947, the United Nations' General Assembly divided Palestine into two states, one Jewish, the other Arab. But the war of 1948 had a different outcome: only the state of Israel was to come into existence; it broke into parcels the territory of the stillborn Arab state with Jordan and Egypt, and 800,000 Palestinians went into exile. Within two editions, "Middle-East : What Can Cinema Do" has asserted itself as an important cinematographic meeting in Ile de France (greater Paris). After the cinema of Israel and Palestine with the conflict as the backdrop, this third edition opens new windows and expresses new hopes of closeness and peace for other Middle Eastern countries. The first two editions of the festival What Can Cinema Do? 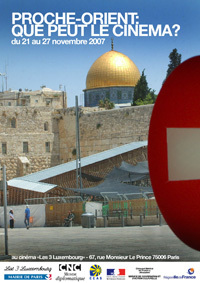 took place in 2003 and 2005 at the cinema Les 3 Luxembourg and focused on the conflict between Israel and Palestine. Your contribution to our event can make a difference. Meet the members of the organising committee.